Overall Strength of a structure such as flexural resistance and abrasion directly depends upon the compressive strength of concrete. According to Wikipedia, Compressive Strength of concrete is defined as the Characteristic strength of 150mm size concrete cubes tested at 28 days. Why do we test at 7, 14 & 28 days? Concrete is a macro content with Sand, Cement, & Coarse aggregate as its micro-ingredient (Mix Ratio) and gains its 100% strength over time at the hardened state. Take a look at the below table. As you can see the concrete gains its strength rapidly til 7th & 14th Days. Then gradually increases from there. So we can’t predict the strength until the concrete comes to that stable state. Once it attains certain strength at 7 days, then we know (according to the table) only 9% of strength going to increase. So at sites, we do normally test concrete at this interval. If the concrete fails at 14 days, then we will reject that batching. To find compressive strength value of concrete cubes. Finish the top of the concrete by trowel & tapped well till the cement slurry comes to the top of the cubes. After 24 hours remove the specimen from the mould. Keep the specimen submerged under fresh water at 27 ° Celsius. The specimen should be kept for 7 or 28 days. Every 7 days the water should be renewed. The specimen should be removed from the water 30 minutes prior to the testing. The specimen should be in dry condition before conducting the testing. The cubes should be placed correctly on the machine plate (check the circle marks on the machine). Carefully align the specimen with the spherically seated plate. The load will be applied to the specimen axially. Now slowly apply the load at the rate of 140kg/cm2 per minute till the cube collapse. 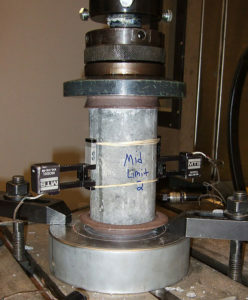 The maximum load at which the specimen breaks is taken as a compressive load. The above experiment should be conducted at the temperature of 27° Celsius ± 2°. As per IS 516, the individual variation in compressive load should not be more than plus minus 15% of the average value. Hope you enjoyed the content. Support us by sharing.